Where to Share your Travel Photos? Web Album, Blog, or Facebook? We’ve been on the road nearly 11 years. We sold our house and started living in an RV in 2003, and we’ve been taking pictures all along the way. There are many ways to store and share your photos. Everyone does it differently, we want to tell you how we do it so that any of our friends can see photos from our travels. We take photos almost daily. They all collect on my computer hard drives, and I pick the best ones to share online. I use Picasa on my computer and I generally organize the photos by month using folder names like 201405 for May, 2014. Picasa is a free program from Google. 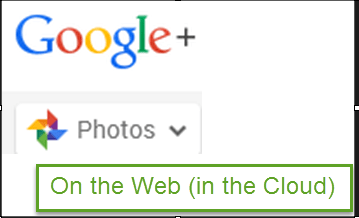 For my online photo albums – “Web Albums” – I use Google+ Photos because it is so easy to upload pictures with the Share tool provided by Picasa. I generally create web albums per month also, but since this is for friends who may not understand my 201405 notation, I name them 2014 May. And, sometimes there are enough pictures of one event to warrant a Web Album just for that event, like Alaska Cruise. Roughly 20-25% of all my pictures get copied and shared to a public web album. I love having all my best pictures in Google+ Photo albums. Because it’s in the cloud, I can access those web albums with any device or computer. We’re having lunch together and I want to show you pictures of my favorite RV park where we stayed in Colorado last summer? No problem. I get out my smartphone, tap the Google+ App and browse my albums till I find last summer’s pictures. Or, I may be visiting a friend’s house. I can sit at their computer, open a web browser and find my photo albums to play them a slide show of our latest trip. And, because I use Picasa on my computer to upload the pictures, any caption I type while using Picasa stays with the picture in my web album and it plays along with the slide show. I like to write journal entries about our travels as well as have the online photo albums. I do that with a Blog. (see www.GeeksOnTour.blogspot.com) A story needs pictures right? So, I use the pictures I’ve already uploaded to Google+ – aka Picasa Web Albums. Each story uses at least one, and as many as a dozen or so pictures. 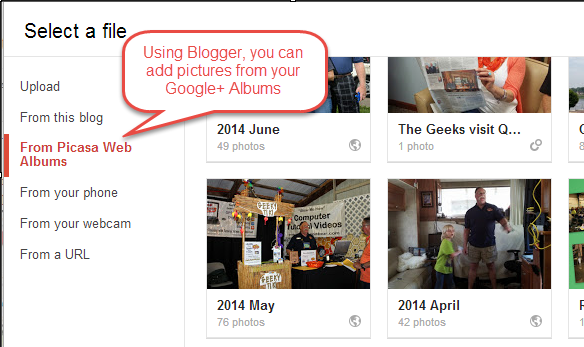 Using Blogger.com, I can simply click the “Insert Image” tool, and choose the option to get a picture from my Picasa Web Album (aka Google+ Photos.) Since both are made by Google, I just need to be logged into my Google account and I have access to all my content. Just because it’s easy for friends to visit my photo web albums, doesn’t mean they’re going to. For friends to see my web albums, or my Blog, they need to intentionally visit those web pages. That’s something they probably won’t do unless prompted. Actually, I keep my web albums and my blog for me. They are my photo albums and journals – my history. Facebook is the best if I really want to share something immediately with friends. I often take pictures with my phone, and instantly share them to my Facebook account. That way, all my friends on Facebook will see the pictures right away, or at least as soon as they look at Facebook. Facebook also give them an easy way to comment on the photos. They’re not organized. When you upload pictures from your phone, they all get dumped in one album called Mobile Uploads. Try finding a picture in that! You can’t just send an album link to anyone – it’s just your friends in Facebook who will see them. It’s important to have all your pictures on a local computer. Then upload your best ones to a web album somewhere. 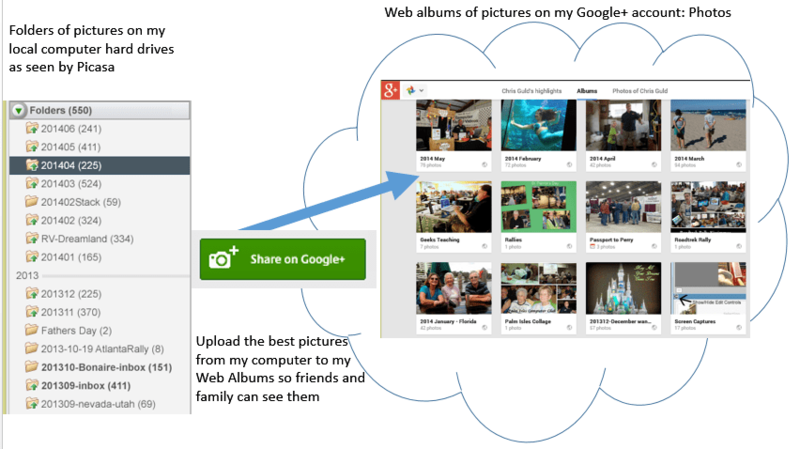 I like Google+ Photos (aka Picasa Web Albums) but there are many more photo sharing websites. Flickr, SmugMug, PhotoBucket, to name a few. Besides being so easy to upload from Picasa, I like Google+ Photos because I can store unlimited number of pictures there at no charge. Published by MrsGeek, in Blog. Tagged with Google Photos, Picasa Web Albums.